The stove moved to its new location. Yesterday I moved the outlet for the stove from the floor under the window to the wall that we had installed to cover the door. Susanna added curtains to the window. The plan for the kitchen redo (this time) was to limit the cost and scope of the work. 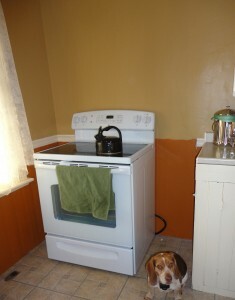 We aren’t replacing the cabinets (just repainting them) or moving major appliances (other than the stove). We aren’t replacing the floor. All of which will need to be done when we finally get around to doing a proper remodel of the kitchen in a couple of years. We are trying to make the kitchen more usable in the meantime. The space between the end of the counter and the wall is 54-inches. The stove will take up 30 of those inches. We have been talking about filling up the remaining 24-inches with cabinets/counters. – We can’t match the existing countertop or cabinets – so it will be obvious that it was added. – Any counter/cabinet we put to the left of the stove will only be 15-16″ deep (not the normal 24″ deep) because of the window location. – Originally we pushed the stove all the way to the right, which would leave 24″ for a cabinet/counter to the left of the stove. It would be shallow, and the top wouldn’t match the counter to the right of the stove, but that would probably look fine. The problem with that is that the stove is then 8″ from the sink, and that felt too close. – Our current thought is to do an even split of the space with the stove. I would purchase a 12″ wide cabinet to put to the right of the stove, and build a 12″ wide and 15″ deep cabinet to the left of the stove. We will put upper cabinets in and a microwave over the stove. – Will centering the stove make the most sense? – What color should we make the countertops? I was going to make them out of white oak to match the (planned) island top. maybe offset the stove, so that by the window there is a smaller cabinet- 8″ (no door needed) for flat things like cookie sheet, pizza pan, carving boards, etc. Then you can have a 16″ cabinet to the right of the stove that you can use for pots and pans – no door needed really. That makes a lot of sense. We decided to get all new lower cabinets and let Home Depot plan that side of the kitchen which will give us more space. However, I like the idea of a wide cabinet to the right of the stove and a short one to the left. We wound up with a 15″ cabinet to the left (I think), but a lot was done to get the dimensions down to standard/stock sizes sold there. I think I’ll have a lot more freedom when I redo the kitchen and make custom cabinets in a few years.